Ishikawa Prefecture (石川県, Ishikawa-ken) is a prefecture of Japan located in the Chūbu region on Honshū island. 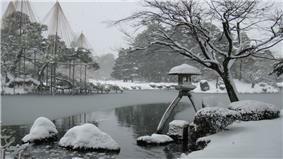 The capital is Kanazawa. 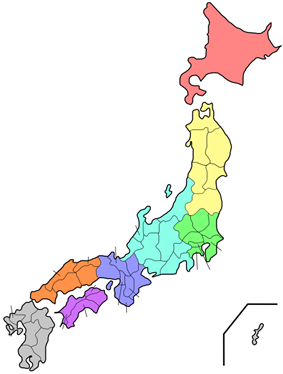 Ishikawa was formed in 1872 from the merger of Kaga Province and the smaller Noto Province. Ishikawa is on the Sea of Japan coast. 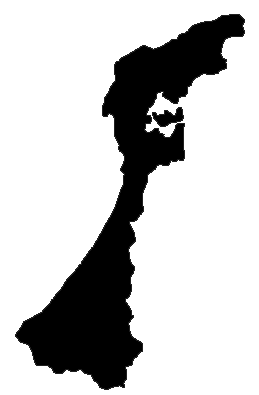 The northern part of the prefecture consists of the narrow Noto Peninsula, while the southern part is wider and consists mostly of mountains with the prefecture's chief city, Kanazawa, located in the coastal plain. The prefecture also has some islands, including Notojima, Mitsukejima, Hegurajima. As of April 1, 2012, 13% of the total land area of the prefecture was designated as Natural Parks, namely the Hakusan National Park; Echizen-Kaga Kaigan and Noto Hantō Quasi-National Parks; and five Prefectural Natural Parks. Ishikawa's industry is dominated by the textile industry, particularly artificial fabrics, and the machine industry, particularly construction machinery. Ishikawa Prefecture has an area of 4,185 km² and as of April 1, 2011 it has a population of 1,166,643 persons. 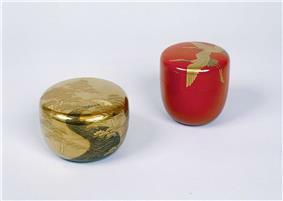 Kanazawa lacquerware (Kanazawa shikki) is high quality lacquerware traditionally decorated with gold dust. The art of Nō was introduced to the area during the rule of the fifth Maeda lord Tsunanori and was refined into the style of Kaga hosho. The tea ceremony was introduced in 1666 when Maeda Toshitsune invited Senbiki Soshitsu of Urasenke to Kanazawa. Kutani ware (Kutani yaki) is a bright colored glaze like Chinese porcelain. Ohi teaware (Ōhi yaki) is a pottery with a style unique to Kanazawa. Kaga silk (Kaga yūzen) is made with complicated silk print technique with an intentional rough look (wabi-sabi). Kanazawa gold leaf (Kanazawa haku) is produced with a technique of beating gold into wafer-thin sheets. Kaga mizuhiki is ribbon-like decoration made from glued Japanese paper (washi). Kaga inlay crafts (Kaga zōgan) are made with a combination of thin flat and thread metal inlays. Gojinjo Daiko is a Japanese Drum, a Wajima City cultural heritage (since 1961) as well as an Ishikawa Prefecture intangible cultural heritage (since 1963). Abare Festival is reputed the most 'fierce' festivals of Noto, Ishikawa. Takeshi Kaga, an actor in Japan who is probably best known internationally for his portrayal of Chairman Kaga in the Japanese television show Iron Chef produced by Fuji TV, is from Ishikawa. Hideki Matsui, a current player for the New York Yankees, was born and raised in Neagari Town (now Nomi City), Ishikawa. He gained fame as a baseball player while attending high school in Kanazawa. Daisuke Nakata, a trampolinist who has competed in the Olympics in the past, is from Ishikawa. 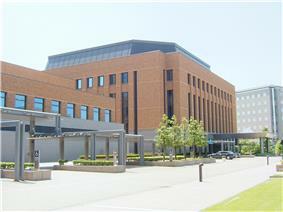 Ishikawa hosts a number of well-known universities. Hokuriku University—a small liberal arts university with a School of Pharmacy and a School of Future Learning that gives instruction in Business, Economics, and Foreign Language (Chinese and English). The current governor of Ishikawa is Masanori Tanimoto who was first elected in 1994 and has been reelected for a sixth term in the gubernatorial election in March 2014. Tanimoto is currently one of two governors who are in their sixth term nationwide, the other being Masaru Hashimoto of Ibaraki. Tanimoto is only the fourth governor of Ishikawa since 1947 when prefectural governors became elected offices, as predecessor Yōichi Nakanishi had held the governorship even longer than Tanimoto, winning his first election in 1963 and then serving eight consecutive terms until his death in 1994. The prefectural assembly of Ishikawa has 43 members and is elected in unified local elections (last round: 2011) in 15 SNTV electoral districts – six single-member, five two-member, one three-member, two four-member districts and the Kanazawa City district that elects 16 members. As of February 26, 2014, the LDP prefectural assembly caucus has 25 members and no other group has more than four members. in the class of 2013 (term ends 2019): Shūji Yamada, LDP, 1st term who was able to defeat Democratic incumbent and former defense minister Yasuo Ichikawa by a huge margin in 2013. ^ Nussbaum, Louis-Frédéric. (2005). "Chūbu" in , p. 126Japan Encyclopedia, p. 126, at Google Books. ^ Nussbaum, "Kanazawa" in p. 467, p. 467, at Google Books. ^ Nussbaum, "Provinces and prefectures" in p. 780, p. 780, at Google Books. ^ "General overview of area figures for Natural Parks by prefecture" (PDF).